South Carolina's love affair with golf is a storied one, its roots deeply plunged into its sandy shores from Myrtle Beach to Charleston and Hilton head many years ago. Charleston chartered The South Carolina Golf Club in 1786. By 1923, members changed the name of the club to The Country Club of Charleston. Seth Rajner fashioned the club's design and two years later, he built Yeamans Hall Plantation. For years, those two facilities were the only two golf facilities in existence in Charleston, and, obviously, extremely exclusive. Myrtle Beach, long before the Grand Strand beckoned tourists to its sandy beaches, built Pine Lakes Country Club in 1927. And,for years, that exclusive piece of real estate was the beginning and end of golf in that sleepy community. However, when the explosion hit the Grand Strand in the 70's, golf changed the face of Myrtle Beach forever. Oddly enough, the annual February pilgrimage by frost-bitten Canadians to South Carolina paved the way for the explosion of golf along the Grand Strand. Driven by the need to thaw out along the sandy beaches of South Carolina, Canadian sun-seekers left the frozen tundra in droves to frolic in the frosty Atlantic ocean as though it were the middle of June. Of course, natives of the Strand thought it rather odd. Following breathtaking morning dips in the ocean surf, the Polar Bears from our extremely northerly neighbors lined up to attack par on the ample courses that line the Strand's boundaries. Of course, more often than not, par prevailed. Though Canadians set the early winter pattern of thawing out to temperatures that would numb the faint-hearted, the steady streams of early arrivals helped spawn yet another growing generation of golfers from the midwest and New England regions, most of whom fell in love with the laid back southern style, the weather, the ocean, the ambiance, and, of course, the great golf course packages. 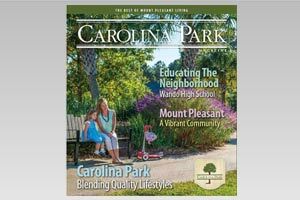 Over the years, the Grand Strand has stretched its boundaries, yet it continues to expand. Still again, there is room for more growth. Jack Nicklaus designed Long Bay Club at North Myrtle Beach some years ago. His golf courses stand the test of time. There might be as many golf courses planed on the strand as there are sands in the hour glass, and only time will tell. Blueprints of new projects are hanging on many an architect's wall as the numbers of new golf complexes dangle on the drawing board. The long and short of that is that the Grand Strand now has over 100 golf facilities. And, there is no end in sight. So, judging by the numbers, just how do South Carolina's golf courses stack up in the Palmetto state? Or, better yet, how has Jack Nicklaus, the Golden Bear himself, influenced golf along the South Carolina coast? In the early stages of his career in designing signature tracks, Nicklaus drew random criticism from various quarters that the highly undulating greens for which was famous were more than the average player could reasonably handle. They were, of course, grizzly bears to the average golfer. "I enjoy Jack's golf courses," says Terry Florence, Director of Golf at Isle of Palms Wild Dunes. "Jack did have a tendency to turn his greens into nightmares for the average golfer early on. In his defense, when Jack realized the problem, he tamed down the humps and valleys, slowing them down to situations that average golfers could handle. "Personally, I have always enjoyed Jack's designs. He puts a lot of thought in his projects. His courses today are as playable for the high handicap golfers as for the low handicap players. I know that there are other architects who don't adjust, don't make necessary concessions. I can definitely say that Jack has modified when necessary. Over the years, we have seen change with him," says Florence. "I love his golf courses and he has done some great work in South Carolina." Nicklaus, certainly, is without peer. His accomplishments are monumental. In his prime, The Bear simply stared most opponents down without batting an eye. Even now, as the sun is sinking low on his playing horizon, Nicklaus is set apart. One of his best works is Colleton River Plantation. The Golden Bear was praised from various quarters for the course he built on the edge of the Colleton River. Pro Cory Renchin is on the pro staff at Colleton River. Renchin says that Nicklaus did a splendid job for Colleton Plantation. "Nicklaus knew that the membership was private, so he altered his style to address the members needs. Our greens are flat and put table. He didn't want to intimidate the members. He was very sensitive to that," Renchin says. "On the other hand, the course is not a pushover. You've got to play, keep the ball inbounds. I like what he has done on our course, and, nobody else has ever influenced golf like Jack Nicklaus has." 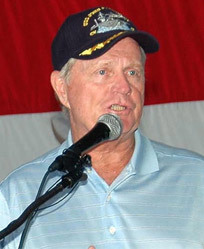 As the millennium calendar ticked down to Point Zero, Jack Nicklaus was honored as "The greatest male player of the century" by an Associated Press panel of experts. At the same time, Nicklaus was also honored as "Father of the year." Quite a menu for the man with a record six Masters titles. "My legacy might be that I changed an era," Nicklaus told the Associated Press after his award was announced. "I came along during an era where the game of golf was more of a stylish game, and I added power. I was probably the first player that played with real power and was successful, and I was able to play with finesse, as well." On top of everything else that is flying Nicklaus' way, the Golden Bear teamed with son Gary in the millennium's last month to win the annual Father-Son Challenge at Naples, Florida, beating Raymond and Robert Floyd on the third playoff hole. "It's special to win," says Nicklaus, "especially to win with your son." As well, son Gary has earned his Tour playing privileges. "I'm thrilled," Gary Nicklaus says. "It's a tough name to carry and big footsteps to fill." As for the senior Nicklaus, a recent hip replacement may extend his playing days on the senior loop. He has designated stops on tour mapped out this year. A reasonably healthy Nicklaus will be an asset on the Senior Tour. As always, Nicklaus will leave room for his design projects. He has built amazing golf complexes around the world. Somewhat recently, Nicklaus finished a project in Mexico that has been highly praised, despite the hoops Nicklaus had to jump through to adhere to environmental issues. Closer to home, among the projects that Jack has completed along South Carolina's coastal plain, is glowing evidence that Nicklaus has made a major impact on the quality of golf within the Palmetto state. Early on, when Pete Dye was commissioned to carve out Harbour Town on Hilton Head Island, Dye grabbed up Nicklaus to assist with the design. It was then that Nicklaus' curiosity was pricked by the complexity it took to bring a golf course to life. 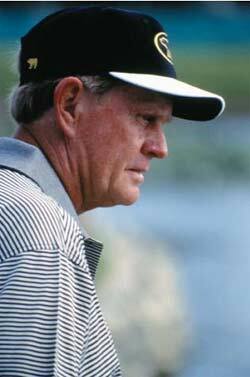 Following Harbour Town, Nicklaus honed his skills on Kiawah's Turtle Point, designed Daufuskie Golf Club, Pawley's Plantation, Long Bay at Myrtle Beach, Colleton River Plantation at Hilton Head Island and the Golf Club at Indigo at Myrtle Beach.